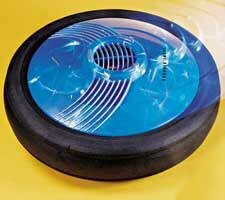 Be it in the office, at home or on the tarmac, you will be fascinated by the way this disc hovers off the ground. Kick it, pass it, hit it with a stick! The new, virtually indestructible high-tech HoverPuck rides on a cushion of air and never touches the ground. Play newfangled hockey or soccer on any smooth surface  indoors or out; it's flashy, noisy...and safely surrounded by a protective rubber bumper. The included 6V rechargeable battery pack provides lots of kick time  90-120 minutes in the plug-in charger gives you 30 minutes of nonstop action. Measures 7 1/2" diameter and weighs 12 oz. 90-day warranty. Ages 7 and older. You can find the HoverPuck at Sharper Image.